Preheat the oven to 425 degrees F. Drizzle the cubed sweet potatoes with a little olive oil, cayenne pepper and salt and place on a baking sheet. Bake for 30 to 40 minutes, until the sweet potatoes are slightly browned. Warm olive oil in a large saucepan on medium heat. Add the onions to the pan cooking them until they are translucent, about 5 minutes. Toss in the cumin and chili powder and cook for about 30 seconds while stirring. Add the beans, reduce the heat to a simmer and cook for 3-5 minutes to heat the beans through. While the beans are cooking, warm up a small pan over medium heat. Once warm add the pumpkin seeds and continually stir them until they begin to expand and turn golden brown about 3-4 min. Warm up the tortillas in a small pan over medium heat. Flipping them to heat evenly. 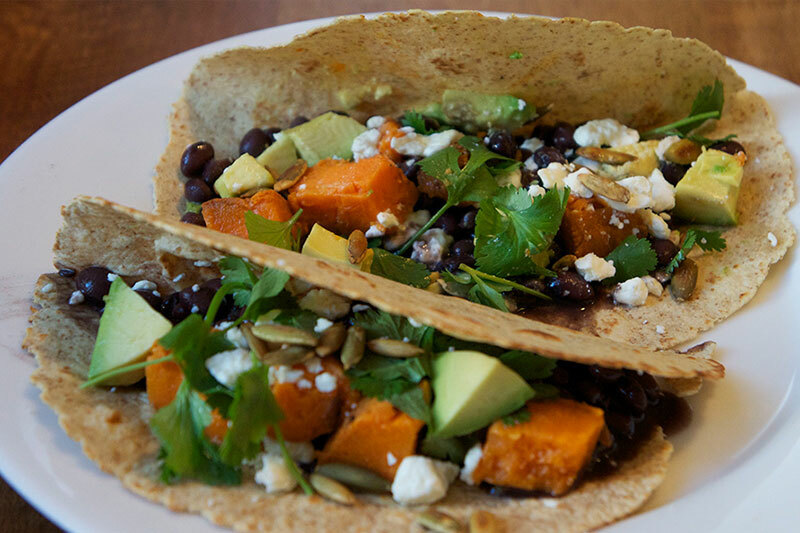 For the Tacos: Add black beans, sweet potatoes, chopped avocado and top with feta and toasted pumpkin seeds and a squeeze of lime.